that you do not talk about HvZ! Anyway, if anyone's wondering what the green armbands/headbands/neckband and the proliferation of Nerf weaponry on the ANU campus today meant, that's what it's for. 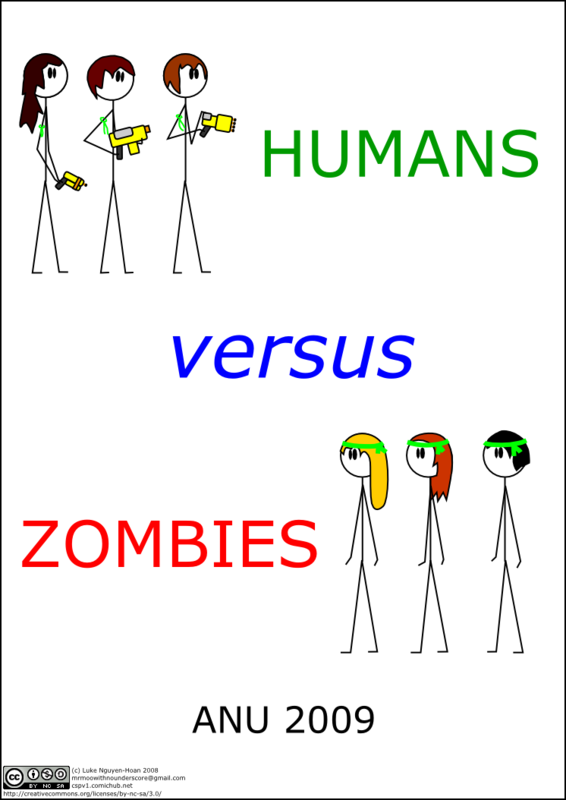 Everyone starts off human, except for two undercover zombies. Humans and the undercover zombies wear the green armband as, well, an armband. Zombies wear the green strip as a headband (so they're easily recognisable). Humans can use Nerf weaponry. Undercover zombies can carry Nerf weaponry (to blend in), but can't fire it. If you get tagged (a solid grab I think is the requirement here) by a zombie (undercover or not), you become a zombie. Zombies are stunned by a Nerf weaponry hit for 15 minutes. While stunned, zombies move the headband down around the neck to indicate they're not a threat. Gah! the headbands never move down around the neck come exam time! !